This week the 5th Annual Harvest the Music concert series kicked off at Lafayette Square with a great concert by Los Po-Boy-Citos and the Iguanas. The square was hopping with people enjoying the beautiful fall-like weather, gathering with friends and supporting Second Harvest Food Bank. 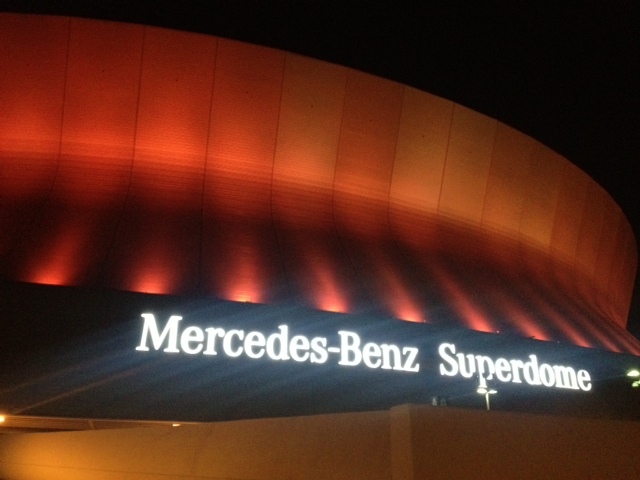 Wednesday night, the Mercedes-Benz Superdome was aglow in ORANGE to support the kick-off of the Harvest the Music concert series and to put HUNGER in the spotlight. The first concert was a big success and this week Dr. John is sure to draw a huge crowd for a great cause. Please spread the word about the concerts and I hope to see you all out there the next 5 weeks enjoying great food, friends and a good time! This entry was posted in New Orleans Women and tagged Benefit Concerts, Community, Concerts, Dr. John, Hunger Action Month, Louisiana, Mercedes-Benz Superdome, Music, New Orleans, Second Harvest Food Bank. Bookmark the permalink.